Today my daughter came out of her shell to reach others and offer hope. This from a shy 18 year old that normally is quiet and keeps to herself. Yet, she knows what it is like to struggle. She has tried so hard through the years to be all that she can be to a man that offers very little to her in return in the way of love. Sadly, this man is her biological father. The pain she has felt due to his neglect of her has been enormous but pales to the pain her step mom was allowed to inflict upon her through words of humiliation and belittling all of those tender years she was forced to spend every other weekend with them. As you can imagine, the weeks in the summer and weeks around Christmas were also torture for her, and she began to act out. She did so in a way not to harm others but to secretly harm herself. All because the pain was so great. What happened in the mist of her pain, she encountered others that felt similar ways. When they latched on to my daughter, it was like a drowning person holding on to her for dear life. With their flaring arms, flapping wildly as she tried to pull them to shore, soon she, too, began to struggle to keep her head above water. She gasped for breath as they pulled her under. Thankfully God allowed her secret to be revealed one evening. I will never forget stumbling upon pictures and posts on her computer. When I learned of how desperate she felt, my heart shattered into a million pieces as tears flowed like a river out of my eyes and down my cheeks. Every part of me ached to take her pain away. She hurt, and I could not save her from the pain she felt in life. This hit me so hard because she’s my daughter! It also hit me hard because years ago I lost my only sibling to suicide. I feared that my daughter was contemplating this, although she assured me that she wasn’t. I prayed and begged God to help her … and to help ME help her! I’ll admit that I did not handle the new found information well at all. I cried, prayed, begged, became angry, and then the waves of pain hit all over again. My daughter … my baby!! With counseling, she was able to become stronger and believe more in herself. She was comforted with bible verses that the Christian counselor equipped her with, along with reassuring hugs from me, her mother. Not even a month ago, my daughter got a tattoo on her ankle that says “Hope.” It has special meaning to her, to me, to the world. She offered HOPE … when others felt hopeless in their situations before, but she is better equipped now to offer her assistance while having a life preserver alongside her when she tries to rescue them from the deep waters. Today, on World Suicide Prevention Day, my daughter came out of her shell and reached out to others to offer HOPE to them. She posted a very heartfelt message on Facebook, and she shared about this organization that means so much to her: To Write Love On Her Arms. I have supported this organization since she first introduced me to it, and I proudly wear their clothing to offer the message of Hope to the world as well. 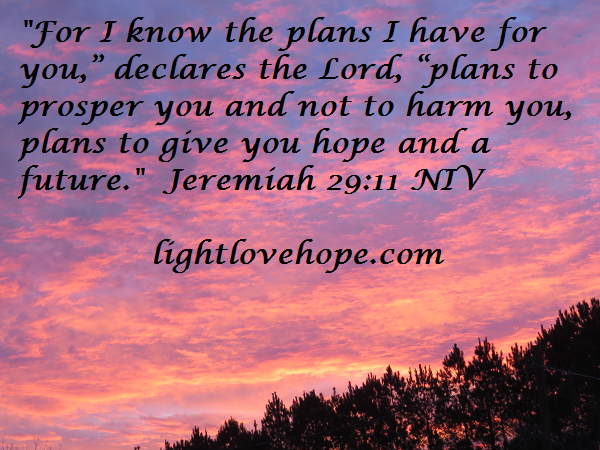 I have a lime green tank top that says, “Hope is real.” It is in honor of my daughter as lime green is one of her favorite colors, and the message is clear as hope is what kept my daughter holding on. Hope is real, and I am forever grateful that this beautiful young lady was able to escape the darkness and emerge to be a light to those around her. I am thankful for how she has grown, matured, and still offers the utmost care, concern, love, and compassion for those around her. Today, I celebrate my daughter and how far she has come. I applaud her efforts to reach out to those to offer Hope in any form. 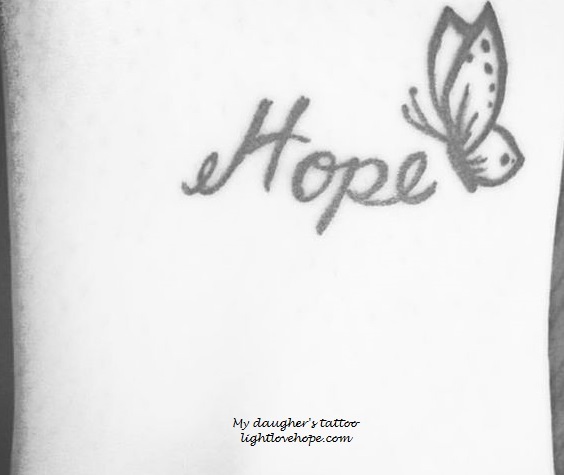 Some are against tattoos, but think of the power that her Hope tattoo could have. Think of the impact that it has to reach others. Look at the word itself. HOPE …. If you or someone you know is struggling with thoughts of harming yourself or thoughts of suicide, please reach out to us or a health care professional. You are not alone, dear one. Help is available. Promise me that you’ll allow someone to come alongside of you to offer you hope even when you’re feeling hopeless. I share my daughter’s story with you tonight to show you where she was and how far she has come. Your story isn’t over yet, and God isn’t finished with you. Please hold on a little longer and a little tighter. Promise that we’ll see you tomorrow … and the next day … and the next. You are loved, and you matter! Your story doesn’t stop here. I know times may be tough and it seems like it will never get better, no matter how hard you try, but I promise you it will get better. There are times where the pressure will seem unbearable, but you have to keep your head above the water and learn to swim. Life is never going to be easy but I promise you it will be worth it in the end. Please never feel like suicide is ever the answer. Suicide doesn’t end the pain, it passes it to the ones who love you. Suicide shouldn’t ever be an answer, no matter how hard it gets. Just this year I lost one of my friends to suicide. I’m here to tell you that it doesn’t end the pain. You might feel that no one cares about you or that no one would notice if you were gone, but they do care and will most definitely notice. Emily felt as if no one would care or notice if she was gone, but her passing had haunted us all. There’s not a day that goes by that I don’t wish I could have stopped her from doing what she did. If I could do anything in this world, I would bring her back. I miss you so much, Em. Not only is today #nationalsuicidepreventionday but this entire week is#nationalsuicidepreventionweek. Organizations like @twloha and @hopefortheday are here to spread a positive message of support and love to those who are struggling with suicidal thoughts and actions. If you are struggling with thoughts of suicide or self-harm, please reach out and ask for help. The suicide hotline ( for the US ) is 18002738255. There are also many text hotlines and chat lines if you are unable to call. Please never lose hope in a better tomorrow. The sky’s are grey now but soon you will have a beautiful sunrise. Hold on to hope. Keep fighting and stay strong. If you ever need anyone to talk to, I am always here to help as best as I can. Your story doesn’t stop here. This week the world lost a very valuable actor, Robin Williams. He was known for some serious roles that he played such as in the movie Dead Poet’s Society, but he was more known to my family for his role in Mrs. Doubtfire and for all of the laughter he supplied to us through the years. My daughters both grew up watching this movie repeatedly. We have watched it so many times that we can all recite lines from the movie. He provided humor right when it was needed in the way that only Robin Williams could, yet he touched on some very serious subject matters in this movie as well. Robin Williams seemed to be America’s funny man. He was usually all smiles for the camera and had a joke or two readily available to give you a big ole belly laugh. The vast majority of us did not realize that Mr. Williams suffered for years with depression. I have heard a lot within the past week of how not only did Mr. Williams suffer from depression, but he was also Bi-Polar which of course has manic and mania tendencies. All I know is that no one truly knows what goes on behind someone’s smile. This is proof right here! Many fans around the world are shocked and are in disbelief over Mr. Williams taking his own life. Looking in the windows of his life, it would appear that Mr. Williams had it all: Fortune, Family, & Fame. However, there were things going on inside of Mr. Williams that tormented him. He had his own personal demons that no one can ever fully understand unless they’ve been right where Mr. Williams was the day he took his own life. No one could have ever imagined that Mr. Williams had depression and suicidal thoughts going on behind that smile of his and all of his jokes. In high school we lost two of our classmates to suicide. I remember hearing the news that my friend had hung himself and how he was clinging to life with the aid of the ventilator. I was unable to visit him in the hospital, and to be honest, I don’t know how I would have handled seeing him in that shape. I just prayed for him and cried my eyes out the next morning when it was announced on the school intercom that he had passed away. I remember attending his funeral with tears falling like rain. I remember my grandmother also grabbing me at the funeral telling me to pull myself together. This shocked me to be told at a moment like this to pull myself together … at a funeral … under the circumstances with the way he died. It felt like I was not allowed to grieve for my friend and then immediately guilt set in for not being able to control my emotions. We lost another classmate a year or so later the same exact way. It left us all asking why something like this had to happen and how someone could take their own life. Then depression and suicide touched my family and brought us all to our knees. This was something that always happened to other people. We always “heard” of this but it was always “over there” in someone else’s family … surely not ours! But, there it was, dropped right in our laps when the world crumbled around us that hot July day back in 2001. It doesn’t seem that long ago, really, and there are times when it seems like just yesterday when all of the feelings and emotions come rushing in. The day my sister took her own life. She died by her own hands. She committed an act that we never would have ever thought she would have done. She drew her last breath on this side of Heaven, and we knew that we would never be the same again. When she died, she took a part of us with her. She was my only sibling, my older sister that I looked up to. And now, I’m all alone in this world without my sister, my best friend. It is so hard to understand how a person could do this, and yet it happens far more than we can even begin to imagine. People get so down in life with different things troubling them. They are in so much emotional pain with things coming at them from every angle. When their problems pile up, they begin to feel as if the only way to end the pain that they feel is to end their life. It’s tragic when it gets to this point. A lot of people say, “If only they would have reached out for help …” and question why such a strong person would succumb to weakness to this extent … you and I will never understand unless or until we’ve been right where they were the moment they made the decision to end their lives. I pray you and I never know how it feels. I pray that we never go through our own personal hell to this extent to where we feel the only way out, the only way to make this better for us and our loved ones is to take matters into our own hands. Please … hear me now, whatever you may be feeling reading this or whatever you may be going through in life, please … I beg you, as a survivor of the aftermath of suicide, please know that help is available. If you could share how you’re feeling with a trusted friend or family member, they will get you the help that you need. Help is also available through the National Suicide Prevention Lifeline by calling 1-800-273-TALK (8255) where you will be connected to a skilled, trained counselor at a crisis center in your area. This service is available 24 hours a day, seven days a week. We talk a lot on this site about choosing joy and staying positive. We try to change our negative way of thinking to find more positives and things to be thankful for. We ask that you focus on things that bring you joy and happiness instead of things that threaten to pull you down. We ask that you give thanks and recognize how blessed you are in this life. We do this for a reason. It isn’t so that we can all live in a bubble of make-believe and pretend, ignoring problems in our lives. No. It is because there ARE so many problems and things that trouble us in this world that we ask you to shift your focus if you are able to do so. We realize that if you are in the pit of depression, this is something that you simply cannot do very easily, if at all. In times like these, we hope that you will speak with a trusted friend or family member and that you will also seek professional help. Please know that there is NO SHAME in reaching out for help. I only wish more people would do so. Oh how I wish my sister had reached out that day instead of taking matters into her own hands. There is such a stigma attached to mental illness and depression. A lot of times, people do not want to share what they are going through for fear of being judged or looked down upon. Please know that it takes a lot of courage to speak up and to tell someone. It takes a lot to reach out for help, but please … I beg of you, if you ever get to this place, please reach out to someone! Over the years I have had several friends that did reach out to me, and I am thankful that they did because I was able to take them to the emergency room at a local hospital for them to get the help that they needed. I have personally taken two people in my vehicle to the emergency room when they have called me for help. It was not easy dealing with this type of a situation, but these people reached out to me in their time of need, and I immediately rushed to their side. I spoke with them at length, and then we made the decision together to go to the emergency room. Thankfully these friends were willing and did not put up a fight at all. They recognized the need for help and were literally crying out for it. And so, they were taken to the emergency room where they were admitted into a program to receive the help that they needed in the form of counseling and medication. They are doing well today, thankfully. I have had two others friends that dealt with suicidal thoughts as well. One was determined no matter what we said to end it all, but thankfully her attempts failed. She ended up in the psychiatric ward on lock down against her will the last time, and I think that was what it took for her outlook to change. She has not attempted since, to my knowledge. The other friend that I spoke of worked in the medical field. He dealt with cases where children were involved, and the cases did not always have the desired outcome. After losing a precious little girl that he had gotten close to with her and her family, he went into a deep depression and attempted suicide himself. He survived and lived to tell about it. He sought treatment and is in a better place today as well. Each of the individuals mentioned above were struggling with things inside of themselves that could not be remedied by a simple attitude adjustment. No amount of positive thinking was going to change their view on life at that moment in time. No amount of anyone saying to “pull yourself up by your boot straps” would help either, instead, often times it would add insult to injury with someone saying such things. We realize that depression, mental illness, and suicidal thoughts is a very serious matter, and that is why we beg of you … please reach out, please talk to a trusted friend or loved one. Here on this site we want you to know that you’re not alone in your struggles. We want to encourage you in every possible way, and we want you to know that you are a precious child of God. We want to offer support to you and give you our love. We want you to cling to hope and put your faith in God to see you through. Every one of us will go through hard times in this life. We are not sure why that is, but perhaps it is so that we can show compassion for our fellow man. Perhaps going through our own struggles allows us the ability to empathize with others. Perhaps it enables us to show more love and kindness. If you or some one you love is in need of assistance, please call the Suicide Hotlines. Help is available, and there are numbers listed by state. By clicking here, you will be taken to the Suicide Hotline page with states listed in alphabetical order for your convenience and ease. Help is available. Hold on a little longer. Know you are loved by your friends here at Light Love Hope. Recently my daughter wrote a post about an organization called To Write Love On Her Arms. We purchased some of their merchandise and have been proudly wearing their shirts. The ones we like the best are the ones that say “You’re Not Alone” and “Hope Is Real.” We have gotten a few double takes as people have seen us walking around with these messages. We feel they are messages that people every where need to see, hear, and feel! How many times have you felt alone in this cold, cruel world? How many would admit feeling hopeless in various different situations? I think, if we are honest with ourselves, we have all had these feelings at some point in our lives. That is why I’m here to tell you today and every day, as long as you need a little encouragement and support along your journey, that you matter! You are enough! You mean the world to someone and may not even realize it. You are not alone as God is right there beside you walking every step of the way, and when you feel at your lowest point or your absolute weakest, that is when God will carry you the rest of the way. When I lost my sister almost 13 years ago, I did not see how I would ever be able to go on without her. I felt like the entire world crashed down around my feet. I could barely breathe and found myself asking how do I go on? It was one of the hardest things to ever face for our family. There were times that I felt so incredibly alone and so hopeless, but I had family and friends that came alongside of me to remind me that they were there, they loved me, and we would get through this together. We all had questions that went unanswered around her death, and it pains us to this very day what happened and the circumstances leading up to her taking her own life. I’m sure at that moment, she felt incredibly hopeless and was filled with such feelings of loneliness and despair. Oh how I wish I could have helped her. I wish I could have saved her. I wish she would have turned to me in her darkest hours to let me help her through this. We all have problems in this life. They seem all consuming at times, and it is hard to think rationally when our heads are spinning as things continue to be hurled at us. What I wish I could have expressed to my sister is how much I love her, how valuable she was to her family, and how much she truly did matter. Just recently our family encountered problems, and we struggled. I felt almost the same identical feelings crash into me this time just as I had experienced almost 13 years ago. The situation was somewhat different, yet the grief familiar. To be honest, our family is still struggling through some very difficult issues. It’s hard to face what has become your reality. You always hear of things happening, but it’s always to other people. Surely this can’t be happening to US! But, it is. In the face of great difficulty, it’s so easy to just throw your hands in the air and give up. That would be the easy way out. Yet, we refuse to do that! Anything worth having is worth fighting for. You just don’t quit when the going gets tough. That is when you hold on tighter and with all of your might. The best thing to hold on to in this life is each other! I was told this past week by a friend that I just refuse to give up until I have exhausted every measure, every avenue … and you know what? That is a very true statement. I refuse to give up. I will do whatever it takes because the person involved is worth it. We are worth it. Our family is worth it. Our children are worth it. Our lives are intertwined, and I believe that HOPE IS REAL for us … for you … for any one out there struggling, no matter the situation or circumstances! Hope is real! I believe it with my whole heart. So, no, I won’t give up until I know that I have tried absolutely EVERYTHING, and then and only then will I throw in the towel. It’s not over … it’s only just beginning. Life is worth living, people are worth loving, and hope is worth hanging on to! When all else fails and you don’t know what to do … pray! Believe that God is working this situation out for His good, for His honor, and His glory … believe that God has plans for us … plans to give us a hope and a future. HOPE IS REAL! I believe it with my whole heart. 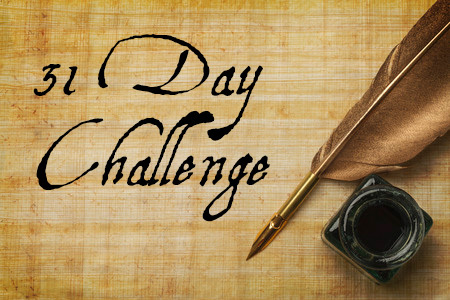 Today’s post will be different than what you may be used to, but it is a message that is begging to be heard. This is something that millions of people every where are struggling with, and I feel very strongly that people need to know about a website entitled To Write Love On Her Arms. This non-profit organization was formed in 2006 by Jamie Tworkowski. It began as an attempt to tell a story and a way to help a friend. To Write Love On Her Arms (also known as TWLOHA) is a movement dedicated to presenting hope and finding help for people struggling with depression, addiction, self-injury and suicidal thoughts. The sole purpose behind TWLOHA is to encourage, inform, inspire and also to invest directly into treatment and recovery. I first learned about TWLOHA through one of my friends who was struggling with self-injury. TWLOHA really helped her to see the brighter side of things. She reached out to TWLOHA and got help. She is now a year into recovery, and I am extremely proud of her and happy for her. TWLOHA helped her beat her depression and focus more on the positive in life. On the TWLOHA site, there are help lines to call if you need help right away. TWLOHA helps millions of people all around the world. It helps by telling individuals that they are not alone. There is always someone willing to help at any time of the day or night. TWLOHA helps to show that your story is important. They works to let people know that it is okay to be honest and that it is okay to ask for help. TWLOHA sells shirts, hoodies, bags, bracelets and posters. With each purchase, the money is donated to helping bring a message of hope and help to the world. If you or someone you love is struggling, please know that you are not alone and that it is okay to ask for help. It truly is! That is the bravest thing you can do is reach out and ask for help. Please know that recovery is possible. It is possible to change and start again. Never lose hope. There are many people in the world who are struggling with things similar to what you are struggling with. If you need someone to talk to, I will do my absolute best to help you. I give you my word. Below I have listed a few hotlines to call. Please know that the call is anonymous to the best of my knowledge. Please don’t be afraid to reach out for help. Your life is precious and worth living.